This was a super busy, fun week as far as running goes (and work too, but that's not always as fun). 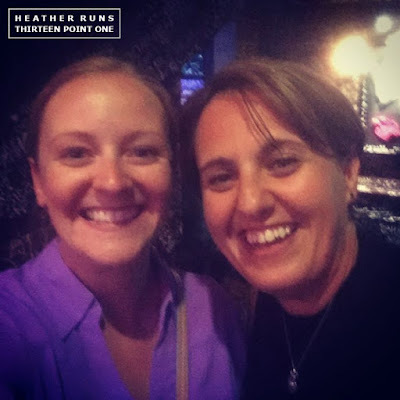 My coach from Sweat Tracker was actually in town for a conference, so Monday night I went into the city to have dinner with her. It was so great to meet her in person. 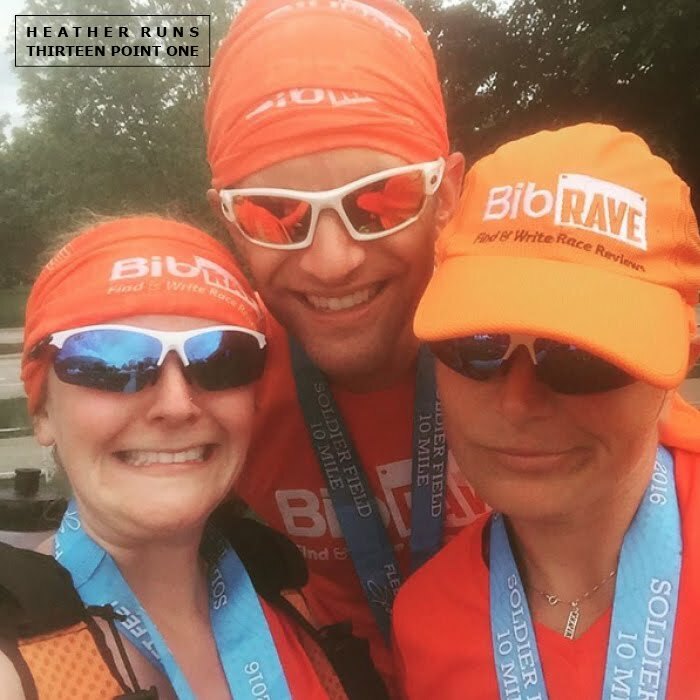 We talked running, upcoming strategies, and life. I feel like having met in person we have strengthened our bond as coach/running student and it's awesome. Something about talking with someone face-to-face adds to the relationship (duh). Also, she agreed to meet for pizza, so I mean... she's super cool. Two days after running the Chicago Spring Half Marathon, I was back where that finished at The Park at Lakeshore East to take part in the United Relay Group Stage 5k. Little did I know I'd make some new, awesome friends and have a BLAST. 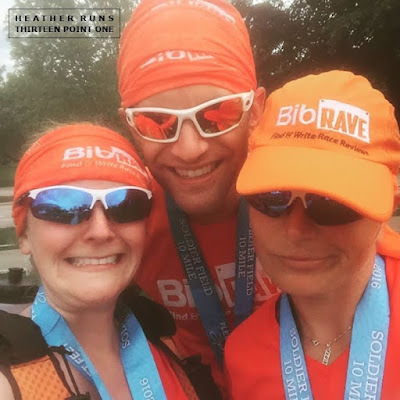 I'll have a blog recap soon about the Relay, but you can read my initial post on it when I first registered if you're interested in reading what it was all about. 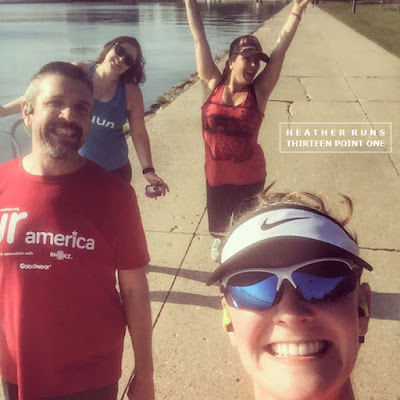 It turned into a very laid back 5k, as about half way through we decided to stop and take photos, meet up with some of the other runners, and then stopped for group photos by Buckingham Fountain... and then walked back to the park. The crew had some time to kill, knowing that some of the legs coming up were cycling, so time would be made up then. Seriously, I had so so so much fun and really look forward to running again next year (and hopefully being available to do more legs!). Here's my BibRave review. So much fun at the United Relay of America Chicago Group Stage! Strength training has been getting tougher each week, naturally. It takes longer to complete each workout, approximately 30 minutes as apposed to the beginning few weeks which were about 15–20 — this is of course when you are beginning to learn all of the different exercises, and then as weeks progress you up the reps and add in advanced forms. I never though I could sweat so much using nothing but my body weight and occasionally a medicine ball or small weights. I'm going to be honest with you. I have very weak arms (part of the reason strength training was needed — I think you remember I've also mentioned my weak core haha). Anyway, I'd been using 3 pound weights when weights were needed, and a 5 pound medicine ball. I attempted 5 pound weights this week, and let me tell you. OW. After about 15 reps my arms were killing me. Maybe I need more time before jumping up more... :-/ (embarrassing!). Thursday was a medium run with 8 miles. I ended with an average pace of 13:44. Not horrible for that distance, for me. I'm still trying to get used to this summer weather... it could take all summer haha.The humidity is just so draining — dehydrating you no matter how much water/electrolytes you're drinking and your body can't cool off because the sweat doesn't evaporate. Woof. Thursday I also headed to Fleet Feet Chicago to grab packets for the Soldier Field 10 Mile on Saturday. While there, I grabbed some new gear (sports bras and shorts) while they were having a sale, and my pal Mike helped fit me for some new shoes. I love my Nike Lunarglide, but I needed another shoe to alternate with when I have back to back runs. While I could probably get away with more Lunarglide, I thought I'd give another style a shot. I ended with the New Balance Vongos. I'll keep you updated on how those go. For now, I'll just be wearing them for errands and walking, then some short runs to break them in. Friday was a 6 mile day. I had a 13:59 pace on this run. I was not feeling the heat and was feeling so drained early on. I walked the last half mile of this run because I was starting to feel sick, but I refused to not get in my 6 miles. Saturday was race day! I had a BLAST meeting up with so many friends at this race — Angie, Josh, Rachel and her husband Mike, Eric, and Jacob. We took some fun photos (naturally), and all headed our separate ways for race time. I'll have a full recap eventually (I have so many to catch up on), but it was fun. In the meantime you can read my BibRave review. Mom and I ran/walked 30/90 intervals. Again, the heat was not my friend come mile 6ish, but we kept on truckin'. Two of my best buds - Josh and Angie. Sunday was a welcomed rest day. I had the whole day free, and though my intentions were to do laundry and cleaning, my husband convinced me it was worth skipping to sit outside with the dogs on our back porch. It was warm out, but in the shade it was lovely because there was a breeze. Though some pesky bees kept bothering us (and our dogs attempting to eat said bees), it was nice to just relax for once. We shared some new brews and chatted. How is your training going? What's your big upcoming race?